Being sick isn’t easy, and being sick every day for the rest of your life sounds like some of the most depressing news a person can receive. That being said, who knew that wit and style could go hand and hand with Rheumatoid Arthritis (RA) and a host of other chronic illnesses? Ashley Boynes-Shuck proves that it’s possible, and she wants to share how she does it. Her message is a simple but powerful one. You need humor, education, and hope. Out of the several themes that run through her well-written narration (she majored in English, thank you very much), the main one is that sometimes you just need to laugh at yourself. She’ll explain to you how she’s come to think of herself as a Sick Idiot, and how that mentality helps with her day to day struggles. She doesn’t shy away from the truth of what it’s like to try your very best at something and still have to give it up due to medical limitations. This concept has touched a wide range of things in her life – everything from softball, to cheerleading, to a career as a teacher. Just because she didn’t eventually become a teacher doesn’t mean she’s given up on education. In fact, she continues to educate people on the concept of being one’s own medical advocate, one of the main reasons that I was drawn to her story. Unfortunately, most people don’t figure out how necessary it is to stand up for yourself medically until something goes wrong. We want to trust doctors to always give us the best care, but they’re only human and they miss things. You are your own body’s best resource. If the medical advice you are receiving doesn’t feel right, it’s up to you to continue on the journey to your own recovery by getting a second opinion. And a third, or fourth if necessary. For anyone who has felt they need to distinguish between “me-sick” and “normal-sick,” she gets you. When she admits, “I’m admittedly a little on the vain side,” she comes across with charm and honesty, rather than as an annoying princess. Truthfully, when I contacted Ashley to tell her that I wanted to review her book, I didn’t know exactly what to expect. Looking at the cover (she’s pictured in a cute red trench holding shopping bags) and reading the synopsis, I leaned towards a girly-girl describing her struggles with RA, peppering it with some humor and inspirational #realtalk. What I got was so much more, and you will too if you take a little bit of time to get to know this Sick Idiot. 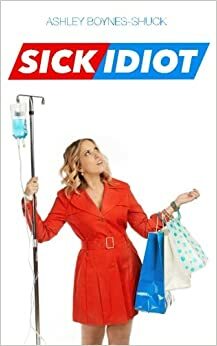 Get your copy of Sick Idiot here. YA Author, published with Cosmopolitan & HuffPost. I care about cheese and my dog. Chep and 13 others upvoted this.